We are thrilled and honored to have another voice from our family of Harper bloggers submit this guest post. Kate, of the Framed Cooks blog, has been dabbling with the recipes in Alice’s Tea Cup has shared her experience with one of their scone recipes with us all. Welcome, Kate! 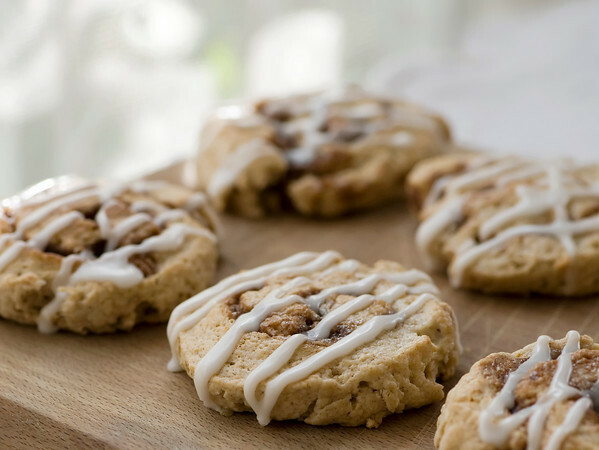 If there are two baked goods I love over all others, they are cinnamon rolls and scones. And if there is one food-related ritual I love over all others, it is afternoon tea. And so when I came across a cookbook that took all these heavenly things and mixed them all up together…well, let’s just say that I was one happy girl. But the recipe that had me at hello was the one called Cinnascones, and yes, they are exactly what you hope and dream they are. 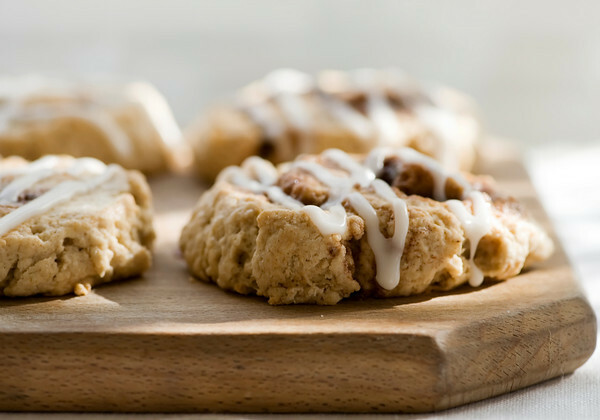 A sweet buttermilk scone dough that is rolled out, spread with a cinnamon paste, rolled up, sliced, baked and then drizzled with a light frosting. Is your mind blown yet? This is a recipe that you will want your handy Silpat for, or a nice piece of parchment paper for the rolling out part, because the dough is a little bit sticky, but if you roll it out on one of those you can lift it up and guide the dough around as you start the rolling up part. Aside from that, the only tricky part is going to be keeping them in your kitchen for more than 5 minutes after they come out of the oven. 1. Preheat oven to 400. In a large bowl, combine flour, sugar, baking soda, baking powder, salt, cinnamon and nutmeg. 2. Work butter into dry mixture using your hands until thoroughly incorporated and mixture is the consistency of fine breadcrumbs. Make a well in the center and pour in the buttermilk and extract. Mix with your hands until combined, kneading about seven times. Add buttermilk as needed until the dough combines into a rolling consistency. 3. Turn dough out onto a floured surface, ideally a Silpat or parchment paper. Using a floured rolling pin, roll into a 1/2 inch thick rectangle. 4. Make the cinnamon paste by combining remaining butter, brown sugar and cinnamon in a small saucepan over low heat until sugar dissolves. Smear over the entire surface of the dough. 5. Starting at one long side, roll the dough tightly to make a long cylinder. Using a sharp knife, slice the roll into 1 inch thick disks. Lay the disks on their side, two inches apart, on a non-stick baking pan. Press them with the palm of your hand to flatten them to 1/2 inch thick. 6. Using a pastry brush,. brush the tops liberally with heavy cream. Reduce oven temp to 350 and bake for 15-20 minutes until golden. Remove from oven and cool for 20 minutes. 7. Make the frosting by combining confectioner’s sugar, milk and remaining extract. Whisk until smooth. 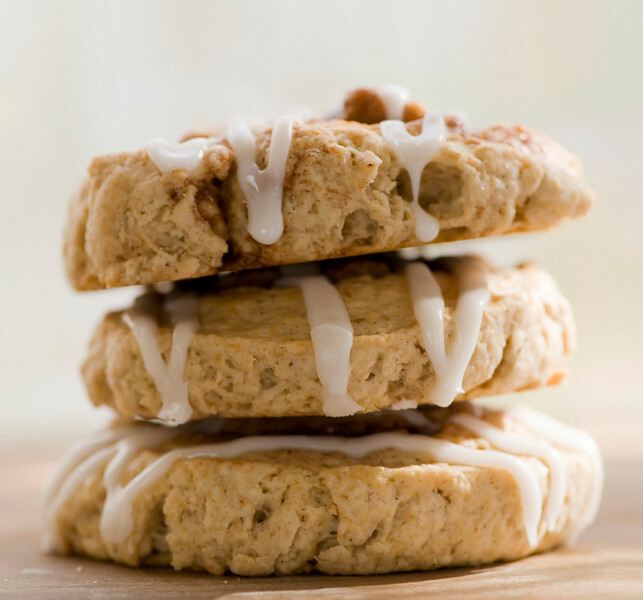 Using a pastry bag or a spoon, drizzle over scones. Serve warm with a nice cup of tea. I love your pictures! This look perfect for a breakfast treat! Are all the recipes you mentioned from that one book? I may have to try and get hold of that! Yes! 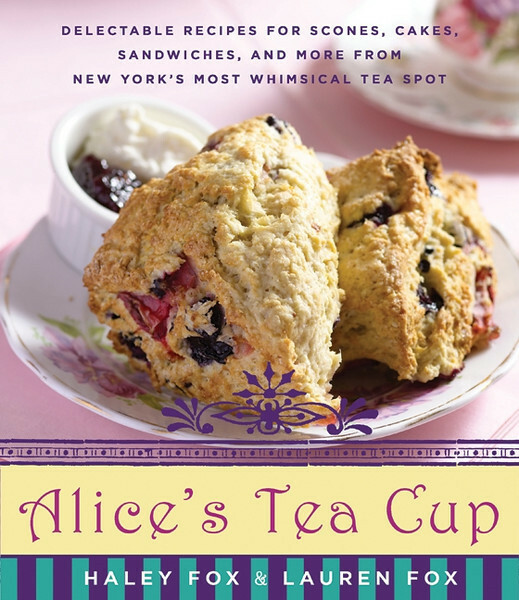 All the recipes are from Alice’s Tea Cup.